POWER TOOLS, GOVERNMENT INTERVENTION…AND BRAINS!!! Like the old song says – We’ll have blood, blood, blood ’til her Daddy takes the chainsaw away! It’s gonna be a bloody good time on this week’s DARK VAULT OF PUBLIC DOMAIN. Join UNCLE PETE as he breaks out his high-tech cranial cuttin’ device and digs up a brain-ful psycho-thriller from 1976, The Brain Machine. Sounds like some gadget as seen on TV in a late night extendo-commercial but it’s about a group of people who volunteer for a secret government brain power experiment – ESP and mind control and food dehydrating and like that. The subjects are subjected to all manner of mind related weirdness and of course, something goes awry. There are some interesting TV type stars here like James Best – the soon to be Roscoe P. Coltrane who some years earlier had left his guitar in Mayberry – as the Rev. Neill. There’s Gerald McRaney – a Simon from Simon and Simon who would later be a major dad – as Willie West. There’s also Barbara Burgess as Dr. Carol Portland and Gil Peterson as another doctor named Elton and director Joy N. Houck, Jr. (son of the guy who brought us a whole bushel of Lash LaRue westerns) – it’s The Brain Machine. And it’s been brand new-ly remixed and remastered to bring you all the action and psychotronic waves sharper, clearer, and more audio-er than ever before! Back at the Vault, it’s brain surgery and some unintended side effects. UNCLE PETE tried some clone modification via a new computer chip that he just got a case of in a storage room auction. But the cranial implant he installed in El Vato (using the brand new Brain-O-Matic 3000(tm)) has turned El Vato into an ultra-violent killing machine, and that ain’t no good. 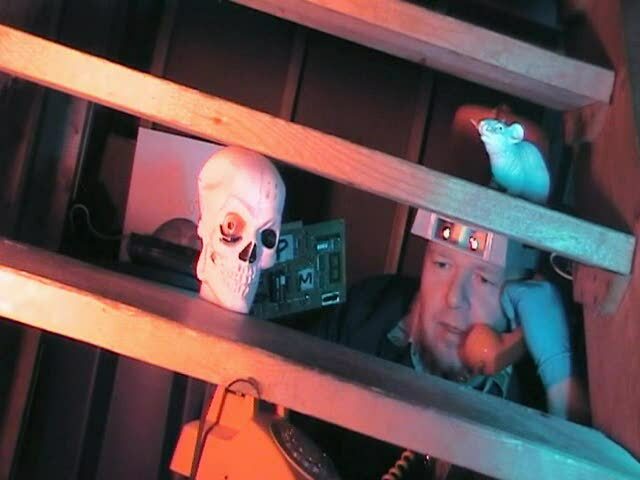 So although UNCLE PETE has to seek safety under an out-of-the-way staircase in the Dark Vault while he tries to contact tech support, he still finds time for a little informational ditty about the brand new movie rating system (G, M, R, and X) and a short scare film based-on-a-real-story film from 1976 called Joy Ride – about stealing a nice old Mopar. It’s brain hacking and brain modifying this Saturday, August 8, 2015 from 10PM to midnight on channel 4 (channel 17 in Sayre/Montrose, channel 99 in Elmira/Corning and Hornell!). Join UNCLE PETE, his Brain-O-Matic 3000 and El Vato for a remastered The Brain Machine – the next feature presentation on THE DARK VAULT OF PUBLIC DOMAIN!!! ~ by UNCLE PETE on August 6, 2015.